We always allow you the choice to opt-out of recieving information from us. If you do not wish to receive any promotional or marketing e-mails and/or surface mail marketing letters, you may opt-out of receiving those communications by using the opt-out mechanism located at the bottom of any email. 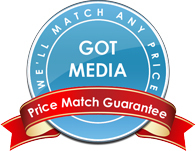 Gotmedia does not rent, sell, or share personal information about you with other people or non-affiliated companies except to provide fullfillment of products or services you've ordered. Email is not recognized as a secure medium of communication. For this reason, we request that you do not send private information to us by email. Some of the information you may enter on our Web site may be transmitted securely via Secure Sockets Layer SSL, 128 bit encryption services. Pages utilizing this technology will have URLs that start with HTTPS instead of HTTP. Please Contact Customer Service if you have any questions or concerns.